I arrived at the theater about twenty minutes before show time. As I headed to theater five as it stated on the ticket, other patrons are all filing out mumbling about a change in the theater. 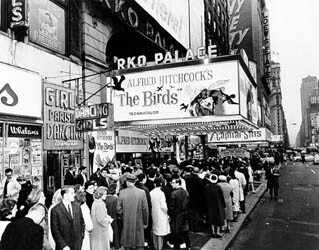 “The Birds” they were told will now be showing in theater nine. So like a wandering herd of sheep we all went strolling over to theater nine only to discover “Finding Nemo 2” was already in progress. The manager, now on the scene, was as perplexed as the rest of us. He gets on his handy dandy intercom and promises to straighten this out. A few minutes go by and we are told to head over to yet another theater on the opposite side of the lobby. The sign reads 2016 (shorten for the documentary “2016 Obama’s America”). For many of us it felt like it may be 2016 before we find the correct screening room. Happily, this was the right theater, as the pre-show entertainment i.e. advertisements on the screen were TCM related. To the theaters credit, the show began on time. I mention this because another theater chain has serious issues with starting films on schedule. The friendly face of Robert Osborne finally appears on screen providing the three quartered filled theater with an introduction as well as some interviews from the past with the film’s stars, Tippi Hedren, Rod Taylor and Suzanne Pleshette. Unfortunately, about halfway through the interviews we lost the picture! A young member of the audience, probably in his early 20’s, ran out and notified management. It took about five minutes and the picture came back on. Oh yes, throughout the introduction and interviews, the theaters lights were never lowered. As the introduction/interviews end, Hitchcock’s film begins. The audience, a surprising diverse age group, settled in for what was going to be a treat. But the horror to follow was still not going to be confined to the screen. Twenty minutes into the film, just as Melanie Daniels (Tippi Hedren) is attacked for the first time while in a small motorboat after coyly dropping off two lovebirds at Mitch Brenner’s (Rod Taylor) home in Bodega Bay, the picture was lost once again! The groans from the audience grew loud, the same young man in his twenties jumped out of his seat once again to find management. A few others followed. Five minutes passed, ten minutes, some people was getting antsy, others just left. By now we not only lost the picture but the sound was gone too. Finally, after fifteen, if not more, minutes the film was back on and reset to start where we first lost the picture. Fortunately, the remainder of the film played without any further incidents though when the film ended, the lights, which were not lowered when the film first began (they eventually did lower), now did not come on after the film finished, so the audience had to stumble out of the theater in the dark! To his minor credit, the theater manager was out there listening to complaints, apologizing and giving everyone a free movie pass. Small consolation to a long anticipated event. The shoddy experience just gives me more fodder for the multiplex mentality we are forced to live with these days. Yes, years ago, film did break in the projector causing an interruption but this particular incident was mostly just a shoddy, poor performance by the theater management and staff. Shifting the audience from one theater to another, lights that did not go out when the film began and did not come up after the film was over, and most irritating two complete interruptions with the screen going blank. No regard for their customers or for the product they are selling and while we as an audience may see film as art or at least as entertainment, for the theaters, it’s a product to sell and their performance was poor, embarrassing and pathetic. Okay, so what about the movie? Well, whenever I think of my favorite Alfred Hitchcock films I come up with a list that looks something like this, “Psycho,” “Rear Window,” “Strangers on a Train,” “Notorious,” “Suspicion,” “Dial M for Murder,” “Vertigo,” “The 39 Steps” and “The Lady Vanishes.” The point being, “The Birds” has never made my best of Hitchcock list. Admittedly, after this most recent viewing my list needs to be revised. The film starts off like it’s going to be a lightweight piece of fluff with its ‘meet cute’ setup between Tippi Hedren and Rod Taylor, a segment that really goes on for quite a while, something like twenty minutes into the film before Hedren’s character, Melanie Daniels, suddenly gets pecked on the head by a sea gull and we start to realize something more horrific is about to happen. With this opening, Hitchcock, ever the sly jokester, has lulled us into a false sense of security. Of course, other Hitchcock films have begun with meet cute openings, “The 39 Steps,” for example. The major difference is “The Birds” get darker and darker as the movie goes along whereas say, “The 39 Steps,” though it deal with spies and misidentification, never really gets too dark or bleak. In “The Birds” it all turns rather nasty and vicious. Why are these creatures attacking? Is it some sort of revenge on mankind by Mother Nature or a cosmic black joke by Hitchcock and screenwriter Evan Hunter? The filmmakers never say for sure why. Ever one for leaving his audience unsure why things happen, the film remains ambiguous about the cause of the birds attacks and as the dark ending reflects, though our characters escape from the trapped house and the village of Bodega Bay, we and them are left unsure whether this is the end or will the attacks spread and how far. Its unresolved ending is one of fear and uncertainty. Hitch longed for Grace Kelly and Cary Grant for the leads but Kelly was already the Queen of Monaco and was not about to appear in a film where she would be viciously attacked by birds. Grant was busy with “That Touch of Mink” plus the long shooting schedule, due to the many special effects, would have made Grant’s salary too expensive. Hitchcock found Tippi Hedren, a model at the time, doing a TV commercial in which a wolf whistle’s at her as she walks down a street. He was entranced by her cool blonde beauty and after many meetings and deliberations signed her to a contract and the lead in the film. The wolf whistle scene from the commercial was recreated in the movie as we first meet Hedren’s character just before she enters a pet shop as Hitch himself walks out of the shop with two dogs. Even though limited as an actress, Tippi Hedren possessed the icy cool look that turned Hitchcock on and works so well in the film. Her character, Melanie Daniels, is a typical Hitchcock spoiled rich girl, her father owns a newspaper in San Francisco, a celluloid sister to Grace Kelly’s Lisa Fremont in “Rear Window.” Throughout half the film Melanie wears a fur coat, a visual symbol that separates her social standing from everyone else in the Bodega Bay community. Rod Taylor has always been a lackluster actor, a second tier Cary Grant. His Mitch Brenner is another in the Hitchcock line of mama’s boys; Norman Bates in “Psycho” and Alexander Sebastian in “Notorious” being examples. The difference being here is Mitch, a San Francisco lawyer, though still somewhat under the influence of his mother, played by Jessica Tandy, when he comes home on weekends is a good guy as oppose to wacky Norman and the Nazi Sebastian. One other scene reminiscent of “Psycho” is when Melanie ventures up into the attic of the Brenner home and is brutally attacked by seagulls. The sequence is cut in a similar frantic style to the shower sequence in the earlier film. 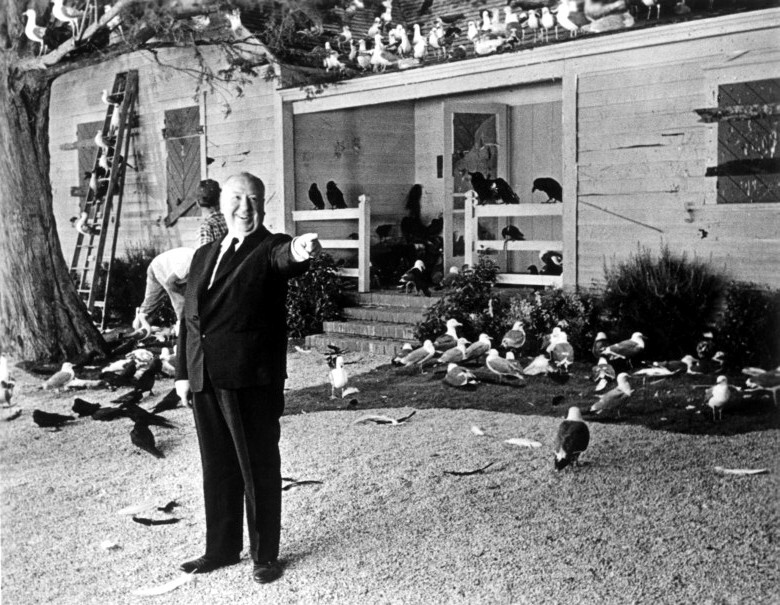 Originally, mechanical birds were supposed to be used but they were unconvincing so Hitch went with live seagulls that had to be basically tossed into Hedren’s face and body. Once she falls to the floor, according to Hitchcock biographer John Russell Taylor, “frantic birds were tied with elastic bands and nylon strings to her arms and legs.” It took an entire week to film this sequence which Hedren endured only panicking when one gull almost clawed at her eyes. This was the first collaboration between Hitchcock and Evan Hunter, author of “The Blackboard Jungle” and “Last Summer.” Hunter also wrote under the Ed McBain name for which he wrote the long running series of 87th Precinct crime novels. The movie is based loosely on a short story by Daphne Du Maurier, an author whose works (Rebecca and Jamaica Inn) Hitchcock previously filmed before. A remake of “The Birds” was announced a few years back. Names like George Clooney and Naomi Watts were tossed around for the leads. Fortunately, the project was put into turnaround and has seemed to have ‘spun’ itself into oblivion. Recently premiering on HBO, a made for TV movie, “The Girl” which takes a look at the off-screen relationship between Hitchcock and Tippi Hedren. Of course, Hitchcock is not around to defend himself but he was known for being tough on actresses, and actors, using them as pawns in his game. Whatever his means he got a decent performance out of Hedren just as he got from Doris Day who gave one of her best performances in “The Man Who Knew Too Much” despite her feelings that Hitch gave her no direction. As for “The Girl,” well there is nothing wrong with it though some facts are left on the cutting room floor, the acting is rather bland as is the entire film, something one can never accuse a Hitchcock film of ever being. This entry was posted in 1960's, Alfred Hitchcock, Essays, Twenty Four Frames Favorite Films and tagged Alfred Hitchcock, Horror, Rod Taylor, Suzanne Pleshette, The Birds, Tippi Hedren. Great post man, excellent work. I find that bad theater experiences end up ruining more than just the film. I have had two unpleasant theater trips watching classic films in the last three months, including one movie that ended up being cancelled completely. When these movies are only shown for one day my expectations are already high and a free pass to come back another time doesn’t seem to make up for my disappointment. Concerning The Birds, it has never been one of my favorite Hitchcock movies either. I think I have always been turned off by the lack of Grant and Kelly in the roles, but after reading your more recent feelings I think it may be time to pull out The Birds again and give it another try. Perhaps next week when the Hitchcock Blu-ray is released will prove to be a good opportunity. I understand Paul what you’re saying, it does ruin an occassion that one anticipates highly and to have it ruined by shoddy work from the theater is extremely disappointing. Still, I hope theaters will continue to have these kind of shows. There is an audience for it. I went to see FRANKENSTEIN and BRIDE OF FRANKENSTEIN at the same theater the other day and happily everything went well. As for THE BIRDS, I’m glad you’re going to give it another try and the Blu-ray will be a good excuse. Thanks! As one who remembers going to the movies at gorgeous old movie palaces, I too despise multiplexes. To go from 2-story high red velvet curtains and statues on the walls — to bare little boxes with chairs — well, it’s pretty hard to take. What a crummy experience you had — one of the worst I’ve heard. I was seeing a movie once at an old neighborhood theatre someone bought and tried to make a go of, and in the middle of the movie the old-fashioned projection bulb burned out. The manager made the announcement that these bulbs get so hot it takes at least 24 hours before you can even take them out to replace them! We got free passes too. Your assessment of The Birds and its ties to Psycho is really in-depth. But I have to disagree with you about Rod Taylor. I think he’s a good actor, and a manly man! LOL! Tippi, on the other hand, is to me like a beautiful mannequin who can walk and talk in a very strained manner. I enjoyed this article very much! Film use to break for sure but at least you were not sitting in a sterile atmosphere. No matter how large or small the old theaters were they hada special style that told you when you walked in something magical was about to happen. We”ll have to agree to disagree on Rod Taylor (lol) I always found him a bit of stiff. Thanks for the kind words! Sorry to hear you had such a horrible experience watching this, John. I recently had a bad experience at a multiplex too, when I went to see the new ‘Anna Karenina’ and the film froze three times (it also isn’t a very good film imo but the problems with the print didn’t help!) – and in the past have had visits where the lights didn’t go down at the start of the film, the same ads and trailers were repeated several times, or the wrong aspect lens was used so that everyone looked tall and thin or short and fat! However, I haven’t had any visit as bad as the one you describe. In fairness, I do remember a terrible visit to a cinema in the “old days” when the film broke in the projector at the end of every reel, so a two-hour film ended up taking about twice that long – and have also occasionally come across reels shown in the wrong order, though that mainly happened when we were shown a film at school as an end-of-term treat! I have seen ‘The Birds’ years ago but don’t remember all that much except for the terrifying scenes of the birds themselves pouring through the window. I did read Daphne du Maurier’s short story a few years back and I believe the plot is quite different from the film, except for the birds attacking. I thought ‘The Girl’ sounded interesting so am disappointed to hear it was a bit bland – I suppose the problem with making biopics when people are alive to defend themselves is that they tend to do so with lawsuits. Anyway, great posting, John, and I hope your next visit to the cinema is much more enjoyable. I actually went back to the same theater this week to see a twin bill of FRANENSTEIN and BRIDE OF FRANKENSTEIN and all went well. No breakdowns at all and the prints were in excellent condition. I found THE GIRL to be dissappointing. Hitchcock is not shown in a very good light and how much of it is true or not is hard to say. Still, the film, whether accurate or not, I thought moved at a rather slow pace. Another TCM showing was also a disappointment. I went to see Casablanca a few months ago at a multiplex. It was terrible. First, I was looking forward to seeing a gorgeous copy of the film projected on the big screen. Nope, it was just a video projector showing a bad copy of the film. The quality of the film was really bad. Way too dark. In one scene you couldn’t even see the actors’ faces. Never again. I’ll just stay at home and watch my my own copy of Casablanca and save $12. I saw CASABLANCA a few months ago too and the copy we had I have to say was in good shape. I can certainly understand your frustration though. As you mention you have high expectations to see this film on the big screen and with good quality. Thanks for your thoughts and please stop by again. Sure will John! Glad I found your site. Oh boy, sorry to hear about the poor management at the theatre. But I loved your analysis of the film! Hi John, Great review. We had an opportunity two years ago to go to a local theater where Tippi Hedren was appearing along with a screening of “The Birds.” She provided a brief intro, took a few questions and then the movie began. Two things bothered me: one, the print was old, so it looked faded and scratched. Second, it was one of these theaters where you can order drinks and food, so toward the end some guys up front were getting rowdy and began mocking the movie. Finally someone yelled loudly for them to shut up, which to everyone’s surprise they did. What did fascinate me about the film was the soundtrack — the sound of the birds was oppressive, a feeling you don’t get while watching it at home but in surround sound is perfectly cringe-inducing. CFB, Thanks. Your experience at the theater sounds bad but it must have a good experience to see Hedren in person. The soundtrack was certainly intriguing with Hitchcock forgoing the standard soundtrack in place of the birds. It definitely added to the atmosphere.. Though I saw the recent special screening of “The Birds” at a multiplex, my experience was, thankfully, much less difficult than yours. 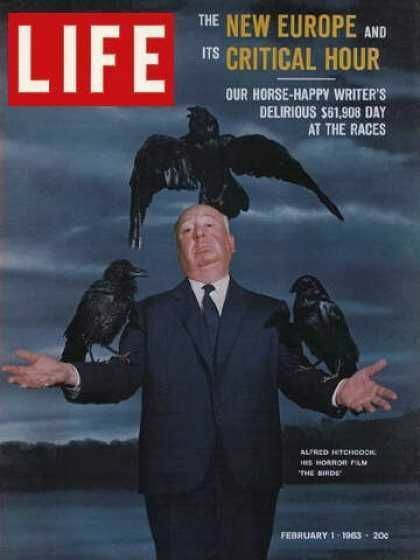 My opinion of “The Birds” itself didn’t change: Hitchcock’s last classic, but not one of his greats. 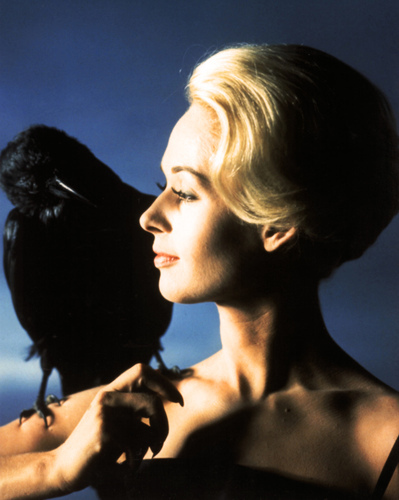 The main problem for me was Tippi Hedren – each time she appeared, the air seemed to be sucked from the screen. Artificial beauty, no presence – too much the posing mannequin. I found Taylor to be more engaging, but he was no Cary Grant or James Stewart. Suzanne Pleshette was capable and Jessica Tandy first-rate. 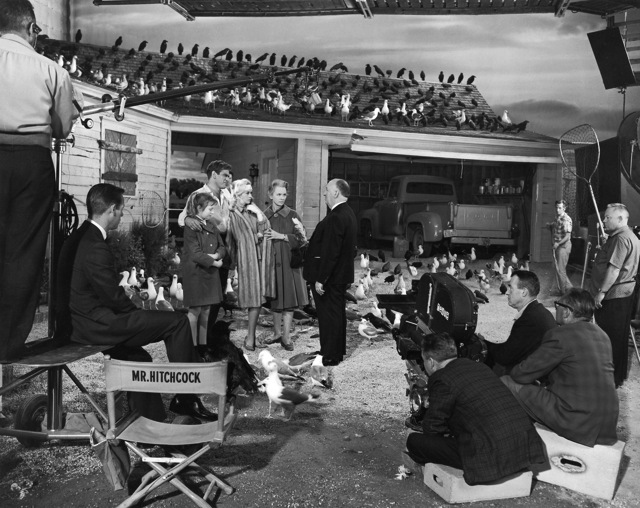 The star of “The Birds” is the birds – the concept, Hitchcock’s unfolding of the tale and the special effects. Great stuff. I haven’t seen “The Girl” yet, though I read an interview in the NYT with Tippi Hedren just before the program aired. She insisted that if it hadn’t been for Hitchcock, she was destined to be a great movie star. I don’t think so. i definitely go along with your thoughts on Hedren, she was model and remained just that. Taylor , I just never feel confortable with. Pleshette was fine and Tandy of course was terrific. Yep, this was top notch special effects for its day and remains convincingly so. I was disappointed with THE GRIL but yeah her problems with Hitchcock aside she would never have made a top of the line movie star. I think “Marnie” is Hitchcock’s last masterpiece. I wish I had time to make an argument for it, although Robin Wood and other critics have done so very nicely. “Topaz” has some very good material. The opening sequence is entirely visual, reminding me of Hitchcock’s skills with silent films. And the sequence in Harlem could have the dialogue removed and still work quite beautifully. There are a number of other spy films that cannot come anywhere near this work. It deserves a reassessment. 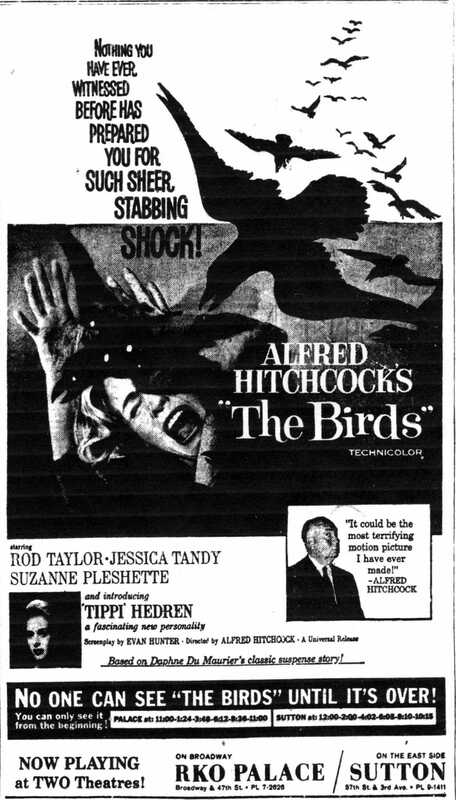 And the HBO film about Hithcock’s treatment of Tippi Hedren was a real disappointment. Hitchcock really did ruin Hedren’s career. Offers were coming in for her but he wouldn’t let her out of the contract. He used his influence with top people in Hollywood to discourage the talk of an Oscar noimination for Hedren’s “Marnie” performance. UNfortunately, the HBO film portrays the director as a monster. He was a very great artist going through what I would regard as a mental breakdown. This is not to excuse his behavior— it was horrible. But the movie turns Hithcock into a villain and ignores any of the complexity of the situation with his actress. It was nice to read an interview with Hedren in which she reports that despite all the dreadful aspects of her work with Hitchcock she is now able to look at the two films with great pleasure. Thanks as always for your informative thoughts. For whatever reason I could never warm up to MARNIE. I have read Wood’s book and know of his fondest for it but it just escapes me. I have not seen the film in quite a few years and probably should give it another try. As you say, maybe it’s time for a reassessment. Hedren certainly got a raw deal with Hitchcock but somehow I doubt, and this is only my thoughts, I don’t think she would of had a big career ahead of her. Certtainly, she would have gotten more roles had Hitchcock not ruined her chances. The entire situation was sad. I too saw this film when it played on the big screen recently for this event, which I saw here in Kalamazoo. I had a better experience than you did thankfully. This one has always held a special place for me. It was my first Hitchcock film I saw…at a friend’s 12th Birthday party. We were all freaked out. After that I sought out other Hitchcock films and soon enough I was hooked. I think this film is better than most give it credit for. It’s not on the level of Vertigo or Psycho, but what is? It’s still a masterpiece IMO. I think it contains my favorite of Hitch’s great setpieces….the scene when Melanie sits outside the school and those children are signing that idiotic song in the background and one by one, those birds begin to perch on the playground. Melanie is unawares. There is some terrific editing in this scene and the audience knows more than she does. We see Melanie as she eyes that one bird flying over to her right and she follows it and follows it with her eyes and then she sees it….the whole playground filled with those crows. Absolutely a masterful scene of suspense. Great great film. Jon, you describe that scene beautifully. I seem to enjoy this film more each time I watch it. It’s beautifully, in a horror way, photographed which creates a atmosphere of doom and uncertainty. With that final shot as they drive away you just know it’s not over. John, the last Hitchcock film I saw on the big screen was “Rear Window” when it was re-released in the 80s. As the first time I’d ever seen the film, it was an unforgettable experience. (It was in a small theater, not a multiplex.) I enjoyed reading your assessment of Hitchcock’s greatest films. I’m sure many of us have similar lists, at least in our minds. I know I do and while not exactly the same as yours, it isn’t all that dissimilar. The film was released with much hoopla. 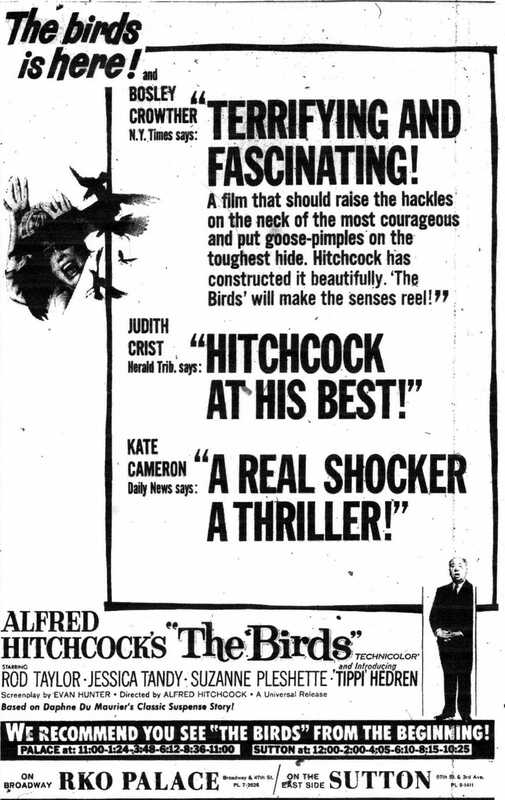 (I guess Hitchcock had seen what pre-release publicity did for the box office of “Psycho” and decided to repeat it but even more so for “The Birds.”) I didn’t see it until many years after its release and found it rather ho-hum. A second viewing several years after that showed me what I had been missing, and I liked it so much I watched it again just a week or so later and liked it even more. It’s not quite the masterpiece that his greatest films are, but it comes close. 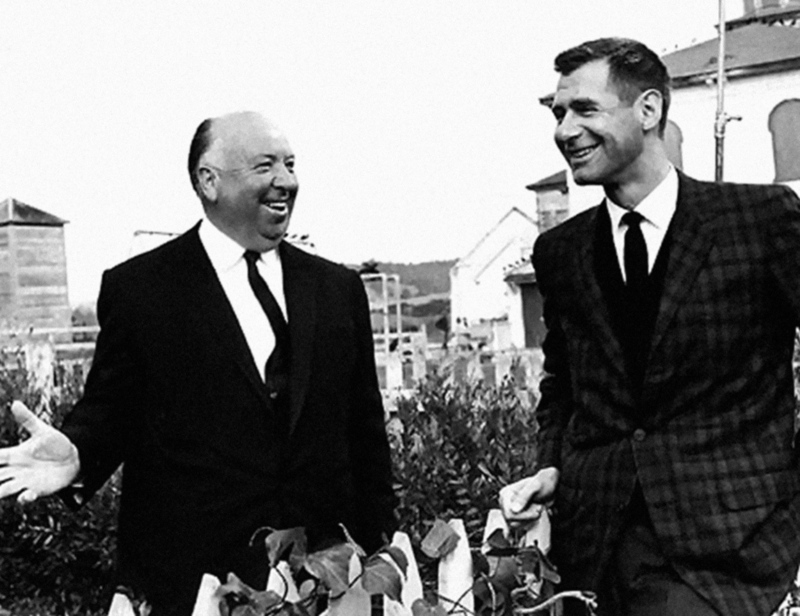 Like you and most people, I find that a shot of star power is the thing that might have elevated it to the exalted status of Hitchcock’s unquestionable masterpieces. Taylor and Hedren do seem rather colorless imitations of Grant and Kelly. For me Suzanne Pleshette, Jessica Tandy, and young Veronica Cartwright have far more screen presence than the stars. I’ve always felt too that the ending was a bit of a letdown, that the film just seems to end arbitrarily. In this respect it reminds me of “Suspicion,” where the final scene is also just a car driving slowly away, although we know that this wasn’t Hitchcock’s desired ending for that earlier film. Anyway, “The Birds” might be often written about, but your approach was fresh and the post a most enjoyable read. Thanks R.D.! The film does end kind of arbitrarily but I think, at least for me, it works. It’s kind of like the bird attacks themselves they are random. And you know the attacks have not ended. Tandy, Pleshette and Cartwright do carry the film from an acting point of view. Thanks, as always, for you thoughtful comments.